This edited article about the Lorelei legend originally appeared in Look and Learn issue number 790 published on 5th March1977. On a clear night in June some sixty years ago, a heavily-laden sailing boat was making its way down the Rhine. It moved swiftly, and the moon sparkled on the broken waters in its wake. The relief helmsman took the tiller. “Anything particular to look out for?” he asked, for he was new to this stretch of the river. “You can’t mistake the place. The river bends sharp to starboard and there’s a cliff falling sheer into the water. Both men laughed. The relief helmsman sat by the tiller and watched the wooded riverbank slipping by. Here and there he saw a clearing, the roofs of a few houses or the spire of a little church showing among the trees. There were no lights. In these parts people went to bed early, and they barred their doors against werewolves and goblins. This edited article about animal scavengers originally appeared in Look and Learn issue number 790 published on 5th March1977. Not content with having allotted to the jackal, the vulture, the hyena and the wild dog, the roles of being the scavengers of the African bush, Nature seems to have gone out of her way also to make them look as unprepossessing as possible. If they were able to speak, they would all surely point out that she had been most unfair, as all of them play a vital role in the ecology of this vast area. Huge herds of wild animals roam over the open grasslands, and while many of these are killed by and eaten by predators, many more fall to disease, accident or old age, with the result that the ground would be littered with rotting corpses, were it not for the attention of these scavengers. There are three kinds of hyena in Africa. The spotted hyena, with its diabolical caricature of a human laugh, is the largest and also the most aggressive, to say nothing of being also the most ugly and repulsive looking of all Carnivora. It is one of the most hated of all African animals with its evil reputation for violating graves by digging up recently buried bodies to feed on them. As if this were not enough to give it a bad reputation, it is also in the habit of carrying off sheep and calves, and even children. True to its basically cowardly nature, it will, however, retreat at the slightest suspicion of danger. The other two kinds of hyena are the striped hyena, and the brown hyena, or strand wolf. The latter species is distinguished by its mantle of long, coarse hair hanging down from the sides of its neck and back, its short, bushy tail and long pointed ears, and the general brown colour of its markings. As scavengers, they are probably more efficient than all the other animal and bird scavengers. A hungry hyena pack usually leaves nothing at all of a corpse, as their powerful jaws enable them to crunch up the bones as well as the flesh. This edited article about King Henry VII originally appeared in Look and Learn issue number 790 published on 5th March1977. He won his crown on the battlefield of Bosworth and at once his troubles began. But Henry VII, founder of the great dynasty that culminated in the incomparable reign of his grandaughter, Elizabeth I, was a born survivor. He needed to be, not least because two impostors made every effort to grab his throne. This is their story. England had been split by the Wars of the Roses between the Houses of Lancaster and York for thirty years and the fact that we now know that the Battle of Bosworth Field, fought in 1485, ended those wars, does not mean that those living at the time realised it. Richard III had been killed at that battle, and why should Henry Tudor, the upstart Welshman with not such a good claim to the throne as Richard, be any luckier? True, he promptly married Elizabeth, daughter of Richard’s brother, Edward IV, which caused the nation as a whole to sigh with relief as it united Lancaster – Henry was a Lancastrian – and York. But, the diehard Yorkists wanted revenge for Bosworth; especially a grim, warped old woman named Margaret, who was Edward IV’s sister. She now lived in Burgundy and was prepared to back any rival of Henry’s, even an impostor. That she was Henry’s aunt by marriage meant nothing to her for her desire for revenge had warped her soul. 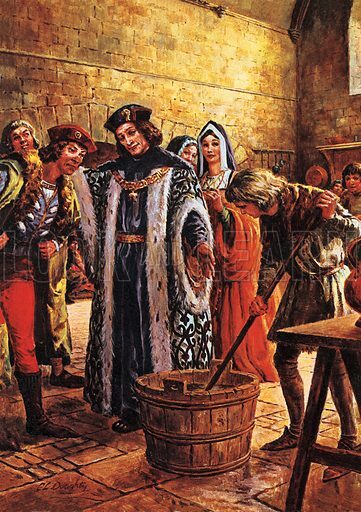 The first impostor on the scene was a boy named Lambert Simnel. That no one is sure if he was a baker’s son or a joiner’s son (for little is certain about his early life), only makes the story the more remarkable. This edited article about Munich Railway Station originally appeared in Look and Learn issue number 789 published on 26th February 1977. A supreme example of the old and the new, brought about not by the passing of time but hastened by the destructive forces of war, is the main railway station at Munich in Western Germany. Although German miners had invented the first flanged wheel and run their first crude trucks on rails, it was the British who first made a commercial success of passenger railway routes. Nevertheless, continental Europe, and Germany in particular, soon caught the railway mania. However, right from the start, Germany decided to build a network of a national and geographical character, instead of the scores of often duplicated routes set up by the many private companies in Britain. The resultant efficiency is proved by the fact that some parts of the German railways still make a profit, although a lot of their traffic has been lost to the roads and airlines. Once again, it would appear that Britain led the way but came off worse in the end. The man behind the German plan was an exile, Friedrich List, who lived in Pennsylvania, U.S.A., where he was the owner of a coal mine. 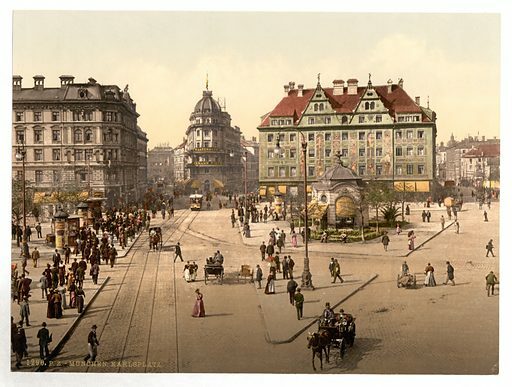 When he was 43 years of age, he was appointed American consul in Leipzig, and on his return to Germany he drew up a plan for a national rail network. This edited article about originally Greek mythology appeared in Look and Learn issue number 789 published on 26th February 1977. King Iobates of Lycia looked down from his high throne at the young man who stood before him. “So you want to marry my daughter?” he said haughtily. Young Bellerophon was certainly handsome enough, thought the king. He came from one of the best families in Greece and had been sent to Lycia by Iobates’ own son-in-law. King Proetus of Argos. If Bellerophon and his daughter Philonoe loved each other, why should he, her father, stand in the way? He smiled more kindly at the young man. 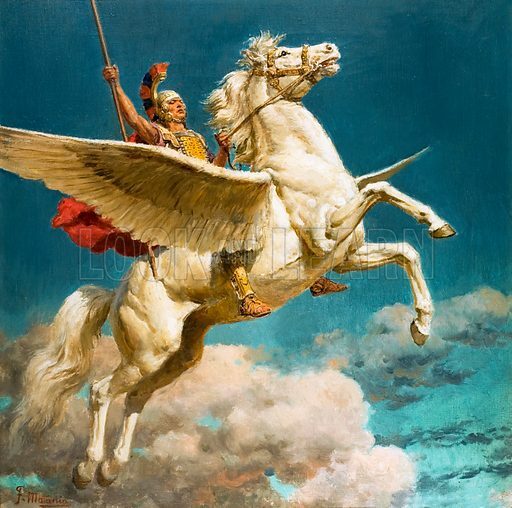 Bellerophon drew the sealed letter from his belt. King Proetus had asked him to take it over the seas to Lycia. There he had met Philonoe and knew his fate must be linked with her and Lycia forever. Surely Iobates would have no objection? But the king’s face had become dark and angry as he read the letter. 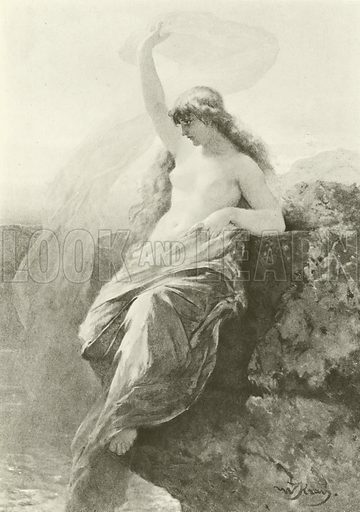 “It’s not so easy to marry the King of Lycia’s daughter,” he told Bellerophon. And there was nothing friendly in his voice. The young man looked up astonished. This edited article about whales originally appeared in Look and Learn issue number 789 published on 26th February 1977. The sea may be the realm of the fishes, but, for sheer size, the real monarch of the oceans is a warm-blooded mammal – the whale. Like the seals and their relatives, the whales are descended from land mammals. 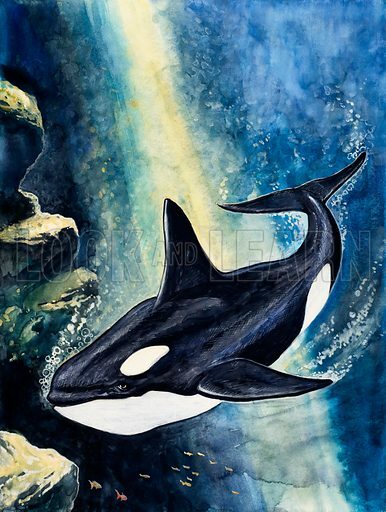 Millions of years ago, their ancestors must have begun to explore first the river mouths and coastal shallows, then the deeper waters, in their search for food. Eventually there evolved that astonishing order of creatures the cetaceans, to which the general name of “whale” is normally given. It includes also the dolphins and porpoises. The cetaceans are far more completely adapted for aquatic life than the seals. It is true that they must still return to the surface to breathe, but otherwise they are just as at home in the sea as the fishes. In their external shape, the whales look very much like fishes. They have the same stream-lined body, tapering fore and aft. The front limbs have developed into fin-like flippers, like the pectoral fins of a fish. They also have a tail shaped not unlike a fish’s caudal fin. But in the case of the whale the tail’s surfaces are horizontal instead of vertical. An up-and-down movement of this tail provides the main motive power in the whale’s swimming action, the flippers giving balance and direction. Most cetaceans have a large dorsal fin, but, like the two “flukes” that form the tail, it has no bony structure, being merely a tough fleshy growth. The “hind legs” of these mammals do not appear externally at all, though vestiges of them can be seen when a dead whale is dissected. This edited article about Louis Pasteur originally appeared in Look and Learn issue number 789 published on 26th February 1977. Foaming at the mouth, the crazed animal ran through the village, biting anyone unfortunate enough to be in its path. The incident made a lasting impression on the nine-year-old boy who had watched in horror from behind the window of his home. Young Louis Pasteur knew only too well that within weeks most of those who had been bitten by the rabid wolf would die of the terrible and inescapable sickness of hydrophobia, or rabies. Later Pasteur went to school in Paris and became obsessed with chemistry. By the time he was 26 he was already carrying out research that was bringing him an increasingly grand reputation, but neither he nor his associates could have guessed that the climax of his life’s work would be the battle against hydrophobia. 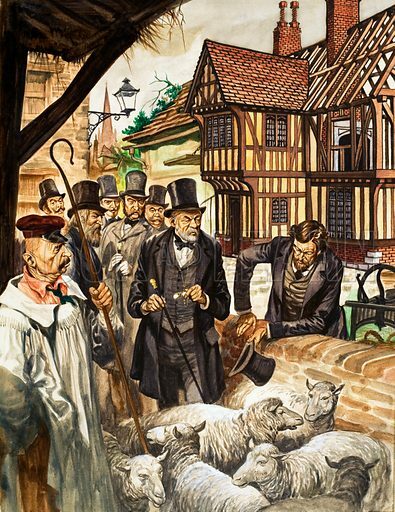 Through his work on fermentation – Pasteur was called in by the French wine-growers to help improve the yields and rid the vats of a scum that seemed to prevent the fermentation process itself – the scientist was able to identify a strange rod-like microbe as the cause. Just 1/25,000th of an inch long, this particular microbe was ‘killing’ the yeast microbes. Much of Pasteur’s work rested on inspired guesses, and now he reasoned that if microbes could do this kind of damage to each other, what might they not do to human beings? He was also convinced that these microbes were in the air, lying in wait, so-to-speak, for their next victim. With characteristic self-confidence he designed an experiment to prove that the air was indeed thick with tiny ‘bugs’ hostile or otherwise. This edited article about Guglielmo Marconi originally appeared in Look and Learn issue number 789 published on 26th February 1977. Flying kites is usually a summertime hobby for young people. But on one historic occasion, the kite flyers were men, and they were doing it in December. 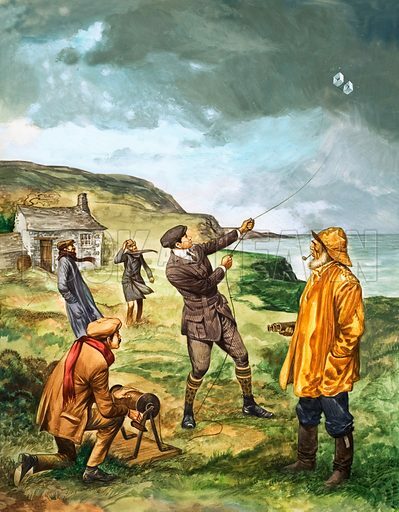 On a bleak headland at St. John’s, Newfoundland, the gale shrieked; and the wind, sweeping down like a solid wall, had already carried away one of the kites. Yet another one went up in its place, and the wire that held the kite trailed off into a lower room in a deserted building. There on the table was a collection of electrical apparatus and an earphone. One of the men picked up the headphone and listened, hoping to hear the letter “S” in Morse Code. Three dots – blip, blip, blip. Nothing. Not a sound. Hours went by, during which the imagination could have played tricks. Even when it came at last the listener could not be sure. He passed the earphone to his companion who listened and nodded. This was it. Why was this an historic moment? It was so because the man who first heard the signal was a young Italian named Guglielmo Marconi. The date was December 12, 1901, and the signal they heard had come through the air from Poldhu, in Cornwall, roughly 2,000 miles away. The story of wireless – and particularly that of Marconi – cannot be told without first sweeping aside the word “inventor”. It is a misleading word, suggesting a brilliant flash of inspiration which, at one bound, gives us a great boon. It hardly ever happens. Most of the great inventions came to fruition through the workings of many minds with one man finally gathering the threads together. 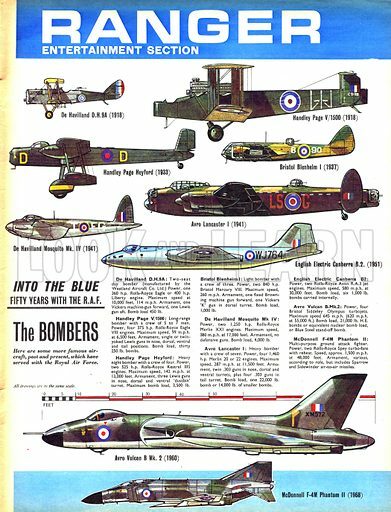 This edited article about British aviation’s flying teams originally appeared in Look and Learn issue number 789 published on 26th February 1977. With their jet trails streaking bright paths of white in the skies, the Red Arrows R.A.F. aerobatic team have earned themselves a place in aviation’s hall of fame. They are the modern successors to the spectacular flying teams that filled the skies with their daring and thrilling exploits at air shows held between the wars. Every summer, the R.A.F. gave displays at Hendon aerodrome near London. A feature of these was a flight of three planes linked by a cord from which hung pennants. One incident that was not often repeated was the looping of a Heyford bomber at Hendon in 1936. The thousands of spectators who witnessed this spectacle could hardly believe their eyes. However, this large and ungainly machine was, in fact, quite manoeuvrable and was looped on several occasions. The Heyford was the last of the R.A.F.’s big biplane bombers. Although the unusual arrangement of the fuselage gave the crew a very good all-round view, the height above the ground of the pilot’s cockpit made it a difficult plane to land, unless the pilot had a great deal of practice. Before it was replaced by Wellingtons in 1939, the Heyford had given many pilots their first experience in handling a heavy bomber, and it continued to be used for various training duties in the early years of the Second World War. This edited article about Nellie Melba originally appeared in Look and Learn issue number 789 published on 26th February 1977. One of the most delicious ice cream concoctions you can buy – a Peach Melba – is a strange and unofficial memorial to an Australian girl with a golden voice. 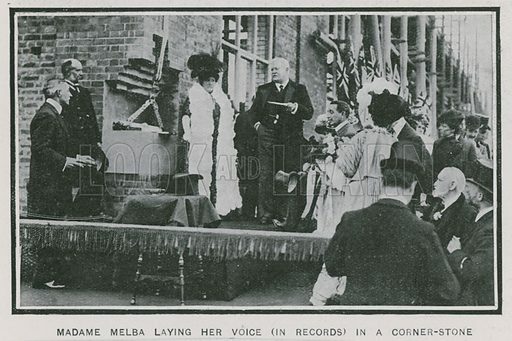 The girl’s real name was Helen Porter Mitchell, but she became known to the world’s opera lovers as Nellie Melba. She took the name from her home town of Melbourne, where she was born on May 19th, 1859. Her musical talent was soon recognised by her parents, and she learned to play the organ. Her genius, however, was not for the keyboard, but in her own voice. In 1882 she went to Paris to study singing, and five years later made her d√©but in opera in Brussels. The critics at once hailed her soprano voice for its purity of tone. Soon the girl from Down Under had become a prima donna, with fans queueing through the night for tickets in London, Paris and New York. Madame Melba, who is particularly remembered for her roles as Mimi in La Boheme and as Juliet in Romeo and Juliet, became a Dame of the British Empire in 1918. She died on February 23rd, 1931. The Peach Melba ice cream, created in her honour, became her favourite sweet, and now perpetuates her name the world over.